I am returning with my new feature... Why I love which takes place on Wednesdays. Today's proclamation of love concerns our Favorites "First Meet" Scenes. This basically describes the memorable time when characters meet for the first time. I had to go back to old school for this one. One of my favorite introductions of characters occurs in Charlotte's Web when Charlotte, a spider, greets, Wilbur the pig. Wilbur jumped to his feet. "Salu-what?" he cried. "What are they, and where are you?" screamed Wilbur. "Please, please, tell me where you are. And what are salutations?" When Wilbur gets it together he looks up and realizes that he is talking to a lady Grey spider who he finds to be pretty. I think that is sooooo cute. I mean, really. I pig finding a spider pretty is kind of cute especially in a children's book. But what I remember most about this scene is what happens next. Charlotte wraps up another bug to drink it's blood and grosses Wilbur out. Lol. So much for cute. Which "First Meet" scenes do you love? Feel free to create your own post and link up. Don't want to create an entire post? Tell me your favorites in the comments. Thanks for stopping by for another week of Why I Love Wednesdays!! 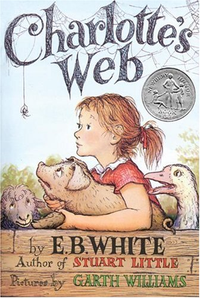 Do you know after all of these years I've never read Charlotte's Web? I vaguely remember watching the movie as a kid. But I am certain I never read the book. Which is weird. I would think this would have been one I picked up. I love that she grossed Wilbur out after introducing herself. Too funny. you really need to read Charlotte's web! It's so wonderful. I saw the old old movie but not the newest one. It's actually kind of hard. There are a couple of first scenes I can think of either because they are funny or because they touch my heart. Oh Jasper and Alices was so sweet! I still need to read the Black Dagger Brotherhood series. I've only read the first one. OMG I love it. I love that this is the one you chose. Oh I love when characters meet. It is that moment that sets the connection between the two and often makes me happy to see what is coming! I know. It's a moment that you can't back either. I want to get to that moment and I don't. It's so important. That is too cute. I forgot about this one! I didn't see the new movie. I saw the old one. I guess I should see it then. this is too cute! and warmed my heart. i LOVED this story as a kid. still do as an adult! I know! I'm still surprised that this is the one that came to my mind. Oh my gosh! I want to read this book now! It is :) Some classics just really work. Aaww, that's so cute! I've never read this book :) I'll try to.